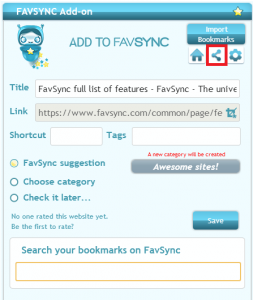 Often, when browsing the web on your mobile device you want to save a website you found as a bookmark on FavSync. FavSync Virtual Email helps you doing exactly that. Here’s how it works: after signing up on FavSync, a virtual email address is automatically created for you with @addtofavsync.com domain name. When sending an email to your virtual email FavSync will extract the links and save them as bookmarks on your FavSync account in the category “From virtual email”. You can choose your own virtual email address in the Account Settings. You can also share your virtual email with friends and colleagues, so whenever they have a new link to share with you, it will be added directly to your FavSync account and will not be lost between the emails. Have you ever wanted to know whether somebody has opened the link that you wanted him or her to have a look at? Sharing Box is an easy-to-use tool that allows you to keep track of the links that you have sent to people and whether or not they have been opened. Sharing Box can be used for marketing purposes as well as social purposes. In case of an email marketing campaign it is vital to check if your emails were effective. Having the option to look at who in your target audience opens your links, you can determine what needs to be adjusted in your campaigns. If you want to share a funny link or a video that you have found online through your social networks or via email and be notified when it was opened, you can do that also through the Sharing Box. Sharing Box also keeps a history of all your shares in one place, so that you won’t need to check everywhere to find a link that you have shared. 1. 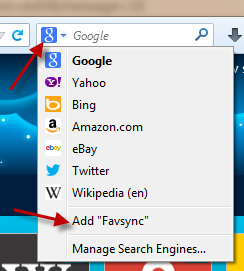 Drag a bookmark from your FavSync page to the Sharing Box (it will slide out at the top of the page). 2. Choose how would you like to share it from the following options: social networks, your personal email, FavSync email or via copy-paste. 3. Optionally, fill in the name of the recipient. 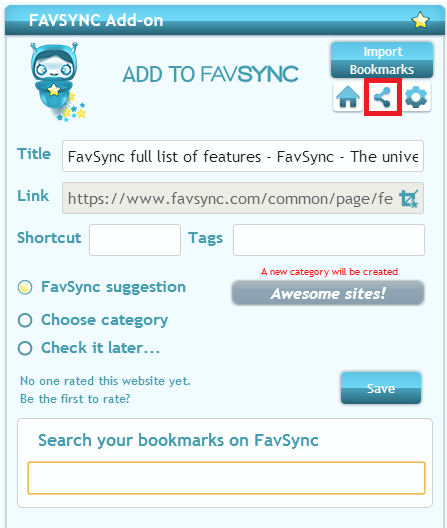 You can also share the website on the go by using the share button on the FavSync add-on. This is an efficient and easy way to manage all your shares in one place and get notified when they were opened. 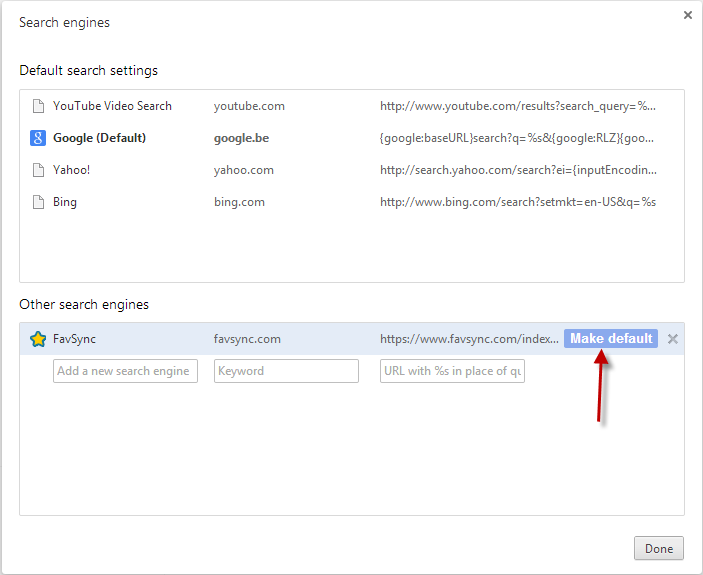 Accessing FavSync bookmarks directly through the address bar! 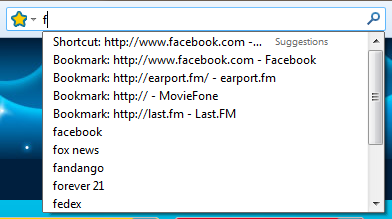 Some time ago, I was telling about how you can access your FavSync bookmarks from anywhere by using the add-on. From now you can do it directly from the address bar, by simply adding FavSync’s results to your existing browser results! In the settings of Chrome press on Manage search engines. This will set FavSync as a default search engine and will combine search results from FavSync, Chrome and even Google autosuggest. 1. You can always reverse it easily, by setting Google search engine as default (or any other search engine you had as default). 2. It will still autosuggest Google and will show the bookmarks and history from Chrome. The only thing that will change is that it will add the results from FavSync to it. And it even works with Direct Search (searching inside websites). Here’s how: start typing the website you would like to search inside, press arrow down to have it selected and add “:” and then your search query. It can be also combined with shortcuts. You can also use it without setting it as a default search engine by typing “favsync.com” in your address bar and by pressing TAB every time. The results are the same as in Chrome, just without the browser results, which are shown directly in the address bar of Firefox, so it’s only the FavSync results + Google results.